Merriott in 1846. Mary Ann is found in the 1851 Merriott census living with Robert’s grandfather William Osborne (1769 – 1851). To me, this tells a tale of a fractured family life, with possibly difficulty in earning a living, and it shouldn’t be surprising to find that George got himself in trouble with the law. Whether he had earlier been in trouble I haven’t been able to find out, but in 1849 he was tried for an offence which sent him to the other side of the world for a term of seven years. No wonder I couldn’t find him on any assisted immigrants lists! George was tried at the Bridgwater Quarter Sessions 3rd July 1849, convicted of stealing a quantity of fowls, and sentenced to be Transported for seven years. George was not immediately sent out to Australia. At this time there was rising public sentiment in the colonies against the acceptance of more convicts. Increasing free immigration meant that cheap convict labour was not needed as before, and indeed tended to devalue the rest of the labour market. I am not sure if George was caught up in this public sentiment, resulting in the delaying of his transport to Australia, or whether it was just a case of normal process, but George was still in England for the 1851 census, as an inmate on the Prison Hulk Stirling Castle, anchored at Portsmouth. He is listed as a prisoner, married aged 21 years, a Labourer born Merriott. Along with George are listed 428 other male prisoners, as well as 33 officers, and servants, and the families of the Governor and the Deputy Governor of the ship. One can only imagine the desperate conditions on board for these prisoners, offshore in a kind of limbo. The other prisoners came from a variety of English counties, and ranged from labourers and butchers to a gun maker and a land agent. The census doesn’t mention any sentences, and it is likely that not all of these prisoners were awaiting transportation. James Edward Thomas notes in his The English Prison Officer since 1850: By 1850 Transportation was becoming difficult, and imprisonment in the UK, sometimes followed by a “ticket of leave” in the colonies, was becoming common practice. There were several uprisings on the hulks, with ringleaders being seized and flogged. This happened on the Stirling Castle at Portsmouth, and Royal Marines were called in. The HMS Stirling Castle was a 74-gun third rate ship of the line of the Royal Navy, launched on 31 December 1811 at Rochester [Wikipedia 2008]. She became a prison ship in 1839, and was broken up in 1861. She was of 1774 tons burthen, length 176 feet (gundeck). Her depth of hold was 21 feet, propulsion sails, and was a full rigged ship. William B Jenner painted a picture (oil on canvas) of a prison hulk, possibly the Stirling Castle, moored at Plymouth. The Stirling Castle was, in 1859, the last English prison hulk to close, with the exception of one at Gibraltar which closed in 1875. [The English Prison Officer Since 1850 – by James Edward Thomas]. From Convict Workers by Stephen Nicholas: From the end of the Napoleonic Wars, schools were established on the hulks, although attendance was voluntary. On the hulk Stirling Castle in 1841, 75% of the 331 prisoners could already read and/or write, while only 80 were illiterate. 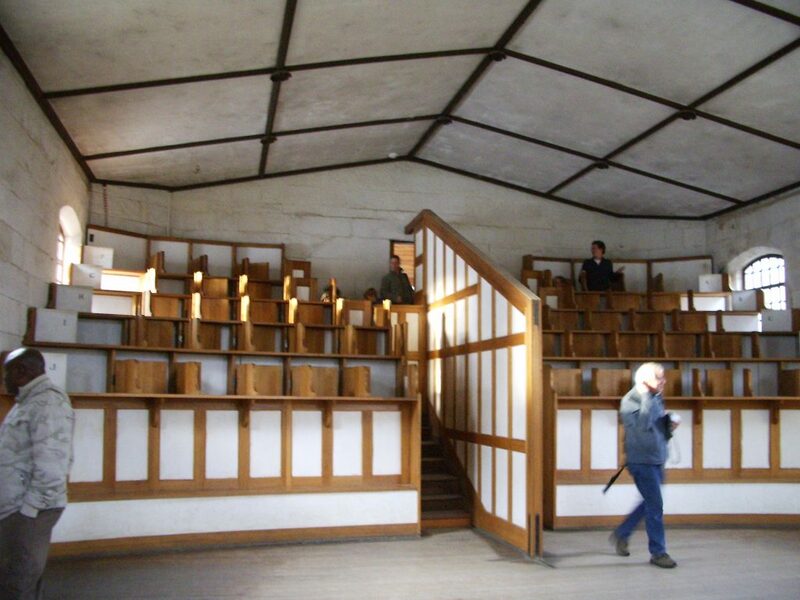 However only 70 attended the school, and some of these were improving their literacy. From the yearly reports on the hulks, Stirling Castle seems to be typical of the proportion of convicts attending schools on the hulks generally. The quality of the teaching was variable, with teachers being selected from among the convicts. For better or worse, George finally left England in 1852, on the Lady Montagu, one of the last convict ships to be sent to Van Dieman’s Land (Tasmania), leaving Plymouth on the 9th of August 1852, and arriving at Hobart Town on the 9th of December the same year. The Master of the Vessel was Andrew Cheyne, and S Donnelly was the Surgeon Superintendent. There were about 260 male prisoners, and crew & passengers comprising Royal Sappers and Miners, and a sergeant and men of the 99th Regiment, numbering less than 100. Statement of Offence: Stealing 14 fowls from near Lambrook? ; also mentions something which seems to say: for pgi 6 months. Remarks: Scar on 4th finger left hand. Other Remarks: W: Hannah, F Joseph, B Samuel & Joseph; S Anna [I haven’t been able to verify a wife, his brother Robert is not listed, and his sister was named Harriett as far as we know, and had died in 1834. So there are a few queries in this information]. George didn’t manage to stay out of trouble after he was granted his conditional pardon. One report says he was tried at Longford on 21st July 1857 on a charge of stealing shirts, but found not guilty. This may have been a separate charge from the following: Tried at Longford Quarter Sessions 21st July 1857 on a charge of stealing a skin of chamois leather, the property of Thomas Jenkins stated this offense. Convicted, to be ? imprisoned and kept to ? hard labour for fifteen months. In this document “Lady Montagu” is noted, so this is likely confirmation of this being our George Osborne. 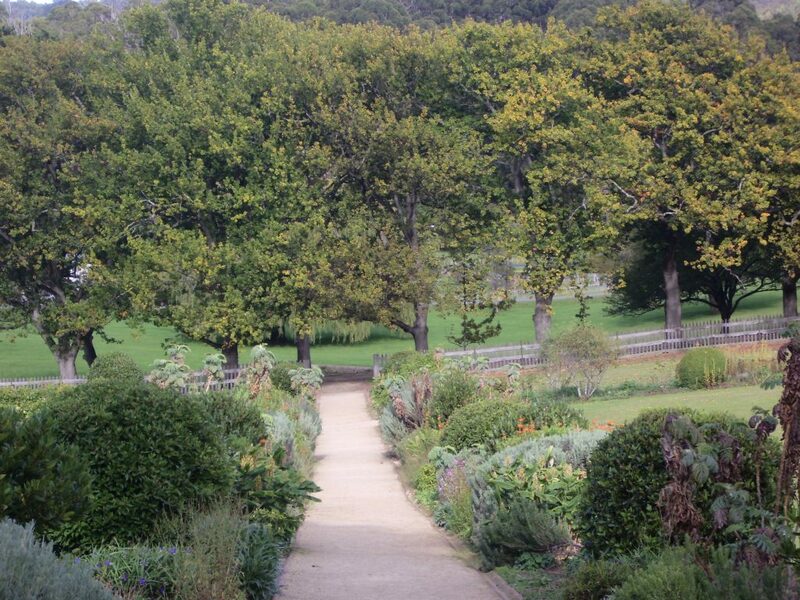 19th August 1857 Prisoners Barracks Hobart; 22nd August 1857 Port Arthur; 18th Feb 1858 Prisoners Barracks Hobart. On completion of half this man’s sentence, the remainder is remitted…. Station of Gang: Port Arthur Freedom: 19th Feb 1858.
the years 1830-33 as the Port’s role moved from secondary punishment station to industrial complex. 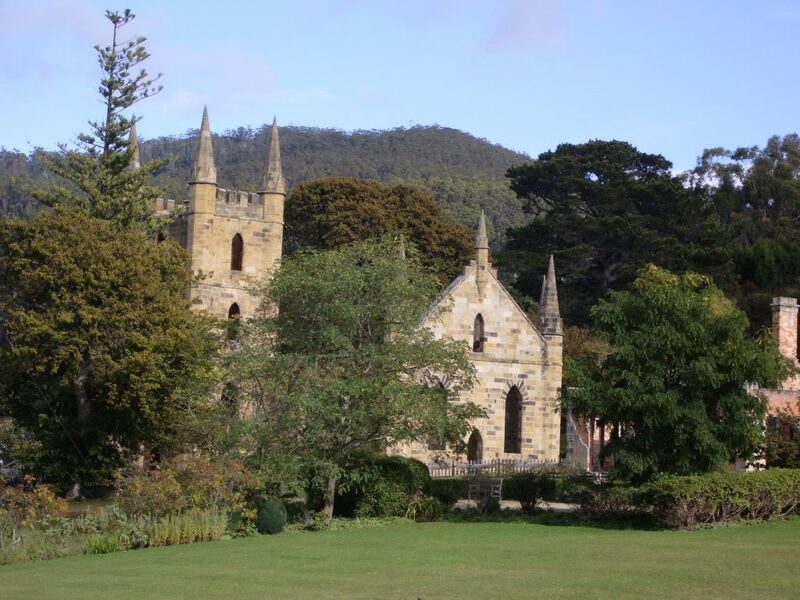 By 1842 Port Arthur was Van Diemans Land’s third most populous centre, with probably around 4000 people living on the Peninsula. Buildings included a Guard tower (1835), Military Barracks (1841-6) convict church (1835-7), hospital (1842) and penitentiary (1853-57). only about three months after its closure visitors started to arrive. 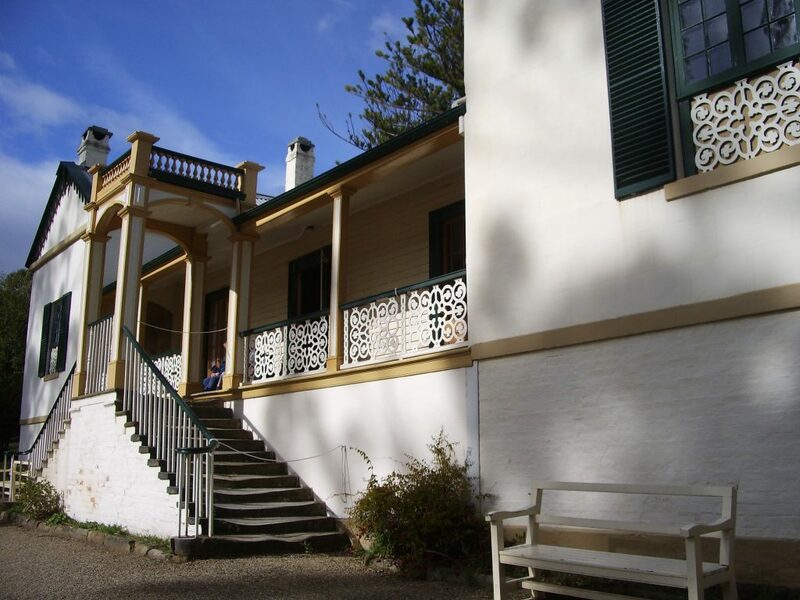 In 1879 the Commandant’s House became a guest house, and in 1885 a hotel to cater for visitors. 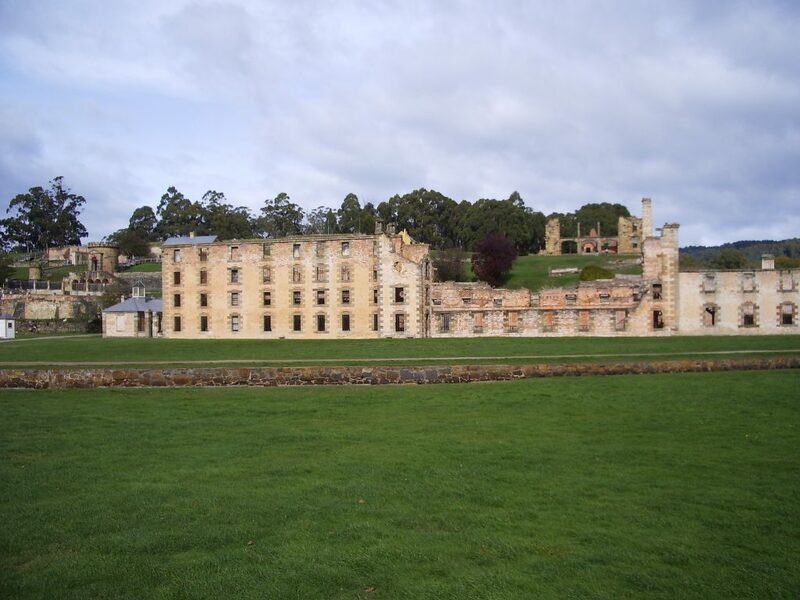 Thus, Port Arthur has been an important tourist attraction in Tasmania for many years. Its original name was resumed in 1927. Fires in 1884 and 1895 caused much of the degradation visible today. 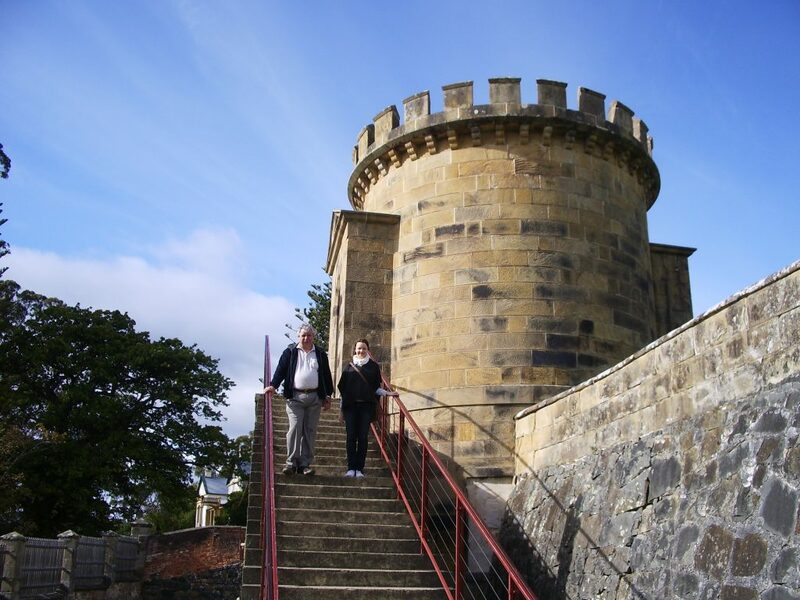 We were fortunate enough to visit Port Arthur at Easter, 2009 and some photos are reproduced below. The entry preceding this in the register is for the marriage of his younger brother Samuel Osborne, our family’s direct ancestor. At this time Samuel was noted as a widower (wife died May 1859), and this was his second marriage, to Fanny Harris. He is also noted as a labourer, with two children, one still living and one dead. Again, his parents’ detail is the same as that stated for George, although their mother’s name was known to be Mary Lawrence. The reason for this discrepancy can only be guessed at. So, Samuel arrived in Queensland in 1858, lost a wife and son, travelled to Melbourne and met up with his brother and his new wife before 25th May 1860. George arrived in Tasmania in 1852, was a convict until 1854, then back into prison 1857-58, and then had moved to Victoria by 1860. You would imagine that the brothers’ meeting in Victoria would not have been a fluke, so one wonders how the two communicated beforehand. George was able to read and write, and had quite a strong signature on his marriage certificate. Samuel, on the other hand, was not able to sign his name on the certificate, and was noted as only being able to read on his immigration details. Somehow they were able to find each other in what was a great big empty land at that time. The brothers both stayed for a while in Melbourne before moving to the Gladstone district in Queensland, a distance of around 1000 miles. They probably would have made the journey mostly by sea. Gold had recently been discovered at Calliope in the Gladstone district, although this was not to last, and I don’t know whether the brothers went there to look for gold. Samuel’s first son, George Amos, from his first marriage, died in Collingwood. Victoria in 1861, leaving him with no children alive from his first marriage. George’s first son, Samuel was born at Diamantina Station, Port Curtis, Queensland on 1st May 1862. Samuel’s third son, Henry George, from his second marriage, was born in Collingwood, on 6th July 1862, although the birth was not registered until the 21st of August 1862, by which time the family had moved to Port Curtis district, Queensland. I wonder whether George and his wife moved to Queensland while she was heavily pregnant? I wonder what kind of a thousand mile trip Samuel’s wife and son had had shortly after Fanny had given birth? For whatever reasons, George left Australia with his young family, and settled in New Zealand, where his second son George was born in Dunedin in 1865. As far as we know this completed his family. George is noted as a Livery Stable Keeper in Carterton, North Island, New Zealand, in a business established in 1884. Neither of his sons lived past their forties, both dying in accidents – Samuel in 1902 and George in 1907. Son Samuel married Augusta Johanna Haizo on 17 February 1898 in Hokitika, New Zealand, and they had two children, Annie Agnes and Samuel Victor. After Samuel died, Augusta remarried to a Forsyth, and the family sometimes used the Forsyth name rather than the Osborne. I am not sure if George’s son George married. I have not found the deaths for George Osborne and his wife Ann Morany/Mulrainey in New Zealand, but I don’t suspect they would have moved countries again. In 2004 I was contacted by Sue Smythe, a descendant of Samuel Victor Osborne. Here I was, Sue Osborne by marriage, contacted by an original Sue Osborne. After years of wondering about George and what had happened to him, out of the blue I get an email which places him in New Zealand after leaving Queensland. Not only that, but Sue’s family had moved back from New Zealand and were living not far away from me. And, for the icing on the cake, I had previously met Sue’s son when he came to work at the same building we were working in at the time. At that stage he’d mentioned that his mother was an Osborne, but the possibilities for connection seemed remote, and we were unable to verify anything, even though he bore a remarkable resemblance to another Osborne cousin of ours. A few years further down the track, a bit more information, and, probably the single most amazing genealogical coincidence in all my research had happened.